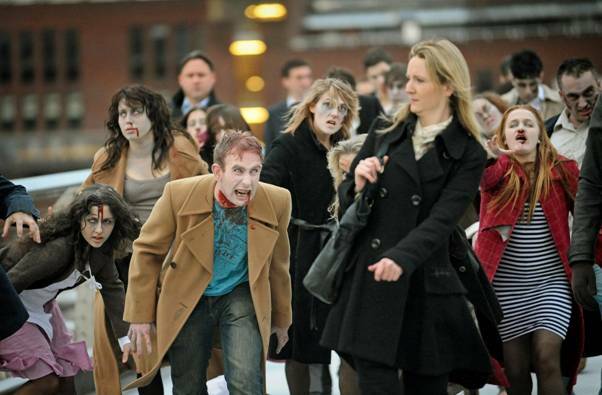 Today commuters across the globe were cowering behind their briefcases as hordes of zombies took over 25 major worldwide cities. London commuters were shocked to see the zombies crossing Millennium Bridge, dragging their decomposed bodies along Southbank, terrifying traffic on Westminster Bridge and finally venturing down to the depths of the London Underground. Luckily, the global attack was only orchestrated to mark the worldwide release of The Walking Dead, a new TV series which see its UK premiere on FX Friday, November 5th at 10pm. Phew! 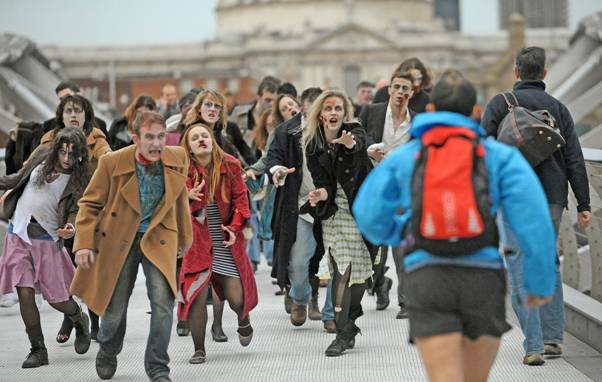 Taking direction from The Walking Dead’s make-up artist Greg Nicotero, swarms of local zombies consecutively took over major cities worldwide during a 24 hour period and were centred in and around the world’s major landmarks. The invasion kicked off in Taipei and spread across cities including Hong Kong, Dubai, Istanbul, Rome, Madrid, Buenos Aires and New York City with Los Angeles as its final stop. The Walking Dead, AMC’s original series, is based on the comic book series written by Robert Kirkman and published by Image Comics. Kirkman serves as producer on the project while Frank Darabont (The Shawshank Redemption, The Green Mile) serves as writer, director and executive producer. Gale Anne Hurd (The Terminator, Aliens, Armageddon, The Incredible Hulk), chairman of Valhalla Motion Pictures, serves as executive producer. David Alpert from Circle of Confusion serves as executive producer. Charles “Chic” Eglee (Dexter, The Shield, Dark Angel) serves as executive producer.